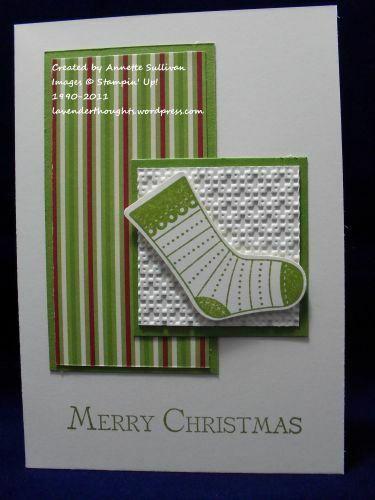 Now that you have seen the Stocking Tag Punch in action using DSP, I thought I would show you how great it is when you use it with the Stitched Stockings stamp set (available October only as a special or you will have to wait until December to get your own). My design for these cards comes from Jamie Adcock in the latest UStampWithDawnand Friends Paper Parade Event. Once again, Dawn has a great set of designers and their projects are spectacular (as usual). Why not join up and you too can enjoy the benefit of their inspiration. Just click on the Blinkie on the sidebar. I don’t know whether or not you can see the little bit of bling in the middle of the snowflake on the stocking in this first card. I made my own little rhinestone-type bling. It is so easy, and you can keep them for ages (I actually made these last Christmas and they are still as good as new). Take a piece of baking or waxed paper ,and using Crystal Effects, make a row of dots – any size you want. Whilst it is still wet, add your choice of glitter. This one uses Dazzling Diamonds, but I have also used Fine Galaxy. Leave your dots to dry overnight, then carefully lift off and store in a small jar until ready to use. To adhere, just add a glue dot. By the way, did you know that you can also make your own glue dots using Multipurpose Liquid Glue? I first saw it demonstrated here. Take a piece of waxed paper (or the paper left over from your real glue dots), and using the Multipurpose Liquid Glue, make a row of dots – again, any size you like. Leave to dry and then roll up the paper. Use in the same way as regular glue dots. Previous How Cute Is This? Thanks for your kind words Veronica. I have been using these multipurpose liquid glue dots for a few years now and have never had any of them lift off the project. Hi, Have just been browsing your site and the tutorial section. Love giving this to myself as a treat :-)) See you have a tip about using the multipurpose liquid glue to make glue dots. Am I mistaken, thought that once you let the glue ‘dry’ a while it becomes repositionable and not permanent? Would really love to know the answer to this as would hate to waste the glue in making the dots if they are only good for holding things for a short while. Many, many thanks for all the tips and tutorials. 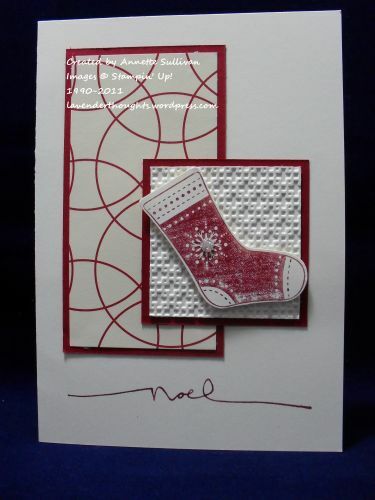 Cute Christmas cards using this stocking punch. Thanks for the instructions for making bling and gue dots. That’s very helpful. These are fabulous cards Annette – I’m really jealous of those stocking stamps and punch! Thanks for sharing your tips about making your own bling and glue dots – I’ll be giving those a try.